This line of concealed carry fanny pack holsters will meet the needs of most to keep your pistol on hand in a most convenient manner. 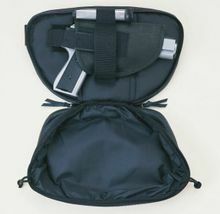 There are 3 sizes of these handgun fanny holsters and two colors brown only. Sizes: Small - 10 x 6 x 3 inches; Medium - 11 x 6.5 x 3.25 inches; Large - 12 x 7.25 x 3.25 inches The Large is 12 inches wide and 7 inches tall made with all genuine leather and will hold most medium and some large frame automatics and revolvers. Medium is 11 inches wide and 6.5 inches tall and will hold medium frame and smaller automatics . Has 2 layers of pockets the 2nd being the gun compartment with Velcro holster that can be adjusted for right or left hand draw. The holster strap has a loop for one magazine. The YKK zipper goes almost completely around allowing easy access to your gun. The luggage grade belt is adjustable to 48 inches. The backside of the pack has a velcro loop to allow you to stabilize with your own belt. 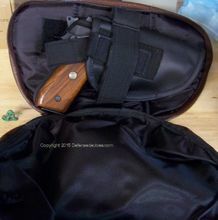 The other pockets are roomy enough for cuffs, cards, magazines etc. Patented. 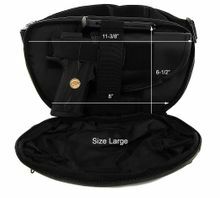 Also, with these compartments on the outside, your gun will not print or be noticeable. Small model (10x6x3) will hold pistols up to 8 inch total length but this is a maximum. Same design features as large model. Now available in Brown leather as model 7070, see dropdown menu to choose. The brown models do not have the small ID card pocket on the end compared to the black "R" models. These are excellent all leather gun fanny pack holsters, but they have their limits. If you have a large, all metal heavy gun with magazine, it will weigh around 2.5lbs or more . These holsters are fine for occasional use for that kind of load. Even better if your gun has a polymer frame and is lighter as a result. However, for everyday wear I would think you can exceed the limit for the large size. I would recommend smaller guns or polymer frames for use with this product. Large: 11" x 7.25" x 3.25"
Medium: 11" x 6 �" x 3 �"
Small: 10" x 6" x 3"
Reference order #195185 I received the 7070 Brown pouch today. It is a perfect fit for the Glock G21 Gen4 pistol. Thanks for your help in making sure i ordered the correct pouch. Product as described and delivered very quickly. Been using carry pouches for more than 25 years. This is one of the best. Generous pockets with excellent zippers. Appears well stitched but only time will tell for sure. I just wish it was available in brown and/or tan. Perfect transaction...! I Highly recommend this company! Quality good great size for CC and your other items.